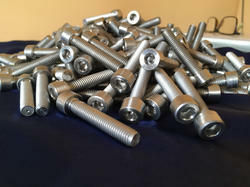 Our product range includes a wide range of titanium fasteners, titanium nylock nuts, titanium aerospace fasteners, titanium screws, titanium nuts and titanium allen cap screw. 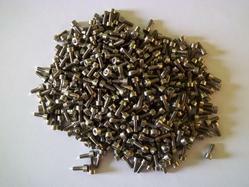 Titanium fasteners are essential for corrosive environment as well as in reducing the weight of an assembly. Typically, weight savings in using titanium fasteners is almost half and they are just about as strong as steel, depending on the grade. Fasteners can be found in standard sizes, as well as many custom sizes to applications such as offshore engineering projects, metal finishing industries, aerospace, marine and automobile sector. Also, our titanium fasteners can be found in internal assemblies of a chemical process equipment. 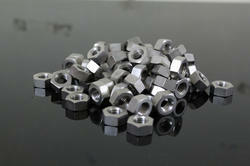 Titanium Nyloc Nuts manufactured and supplied as per DIN standard. These are widely being used in Chemical Process Industry. Titanium fasteners are essential in reducing the weight off an assembly. Typically, weight savings in using titanium fasteners is almost half and they are just about as strong as steel, depending on the grade. 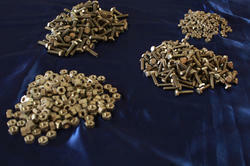 Fasteners can be found in standard sizes, as well as many custom sizes to fit all applications. Grade 2 titanium fasteners are equivalent to the strength of grade 2steel. Grade 5 fasteners can be as strong as grade 5 and grade 8 steel. Titanium Screws M3 x 0.5mm pitch 8 mm long made of Ti AL6V4 alloy with hexagonal socket head cap screw made as per customer specification. 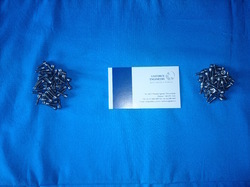 These screws are used for Aerospace / defence application. 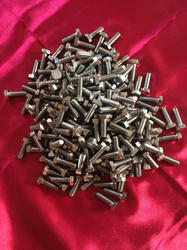 Titanium nuts manufactured and supplied as per METRIC, DIN, ISO ASME standards. Head forged and thread rolled. 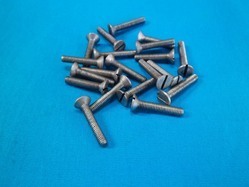 Titanium allen cap screws are best known for being strong, lightweight and corrosion resistant. One property that stands out when compared to other metal socket head cap screws is that titanium socket head cap screws have the highest strength-to-weight ratio with a density of 4.51 g /cm3. As an example, titanium grade 5 is 4 times stronger than 316 stainless steel at nearly half the weight. This makes titanium allen cap screws ideal for applications that require both lightness of weight and excellent strength such as oil & gas (down-hole), military and sporting goods. 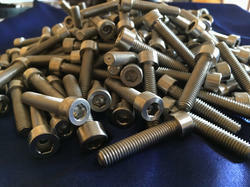 Titanium socket head cap screws are also unique among metals in the chemical processing industry for handling chlorine(wet) and chlorine compounds in aqueous solutions. 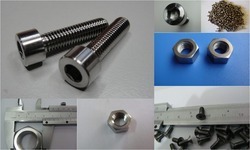 Titanium socket head cap screws are also used in metal finishing industry. 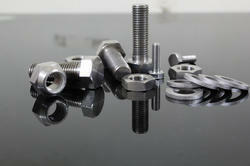 Uniforce Ensures fastest delivery for standard titanium fasteners in accordance with Metric and DIN Standards. We are a leading suppliers of quality titanium fasteners to various corrosive environments across a range of process industries, metal finishing industries and aerospace applications. Uniforce manufactures and Supplies entire range of fasteners the most recent ASME, DIN, ISO or Customer stated standards with either full or partial threaded options. If additional features, requirements, or specifications are needed, please specify and consult our marketing team before submitting our quote. M3 x10 Titanium Socket Head Counter Shunk screws manufactured in accordance with DIN standard. Material AMS 4928. These are being used in Electronics Industry. M4 x18 Titanium Gr.2 countersunk screws to suit srew drivers. 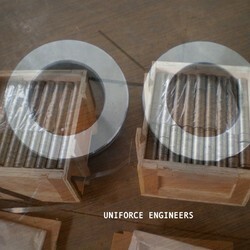 Uniforce manufacture and supply these screws any qty at a competetive rate.